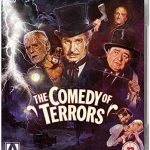 The Comedy of Terrors is a hilarious horror spoof. A funeral director, who is in arrears on his rent, aggressively pursues customers to bolster his business … And the fact that they haven’t died yet doesn’t bother him at all! ﻿ The Comedy of Terrors is a dark comedy. A hilarious, funny, rolling in the aisles comedy! If you haven’t guessed yet, I highly recommend it. The comedy comes from this very talented cast. Everyone gives a funny, hilarious performance. I can’t point to a single person as “the funniest” – they all shine. And Peter Lorre and Vincent Price’s teamwork is wonderful. They could easily have been a comedy team if they’d wanted to. Waldo Trumbull (Vincent Price, The Fly). Waldo is many things. An undertaker, with no (paying) clientele. An alcoholic, who ignores and insults his beautiful wife. A man who keeps threatening to poison his father-in-law (from whom he inherited the business). Just to annoy his wife. Doesn’t sound funny, does he? But Vincent Price’s performance is absolutely hilarious! Felix Gillie (Peter Lorre, Casablanca). Waldo’s assistant, whom Waldo bullies constantly. Felix has a criminal record; an inept criminal, but Waldo never lets him forget it. And Felix is hopelessly in love with Waldo’s lovely wife. “The voice of an angel!” Peter Lorre absolutely shines here. Amos Hinchley (Boris Karloff, The Black Room). The slightly-senile father of Amaryllis, who’s slightly deaf as well. The original owner of the funeral parlor, who doesn’t realize what his son-in-law is doing. Boris Karloff gives a great comedy performance here, even as a secondary character. He could have had a successful career in comedy if he’d wanted to. John F. Black (Basil Rathbone, Son of Frankenstein). The landlord of the funeral parlor. A man who hasn’t been paid for a year, and is about to evict the Trumbulls. A man who likes to quote Shakespeare. And, he suffers from cataleptic fits, that makes it look like he’s dead. It’s absolutely hilarious when Trumbull and Gillie keep trying to bury him. And he keeps getting back up! Cemetery Keeper (Joe E. Brown, Alibi Ike). A minor role that Joe E. Brown is hilarious at. He does his trademark loud yell when he hears John Black … in his tomb!